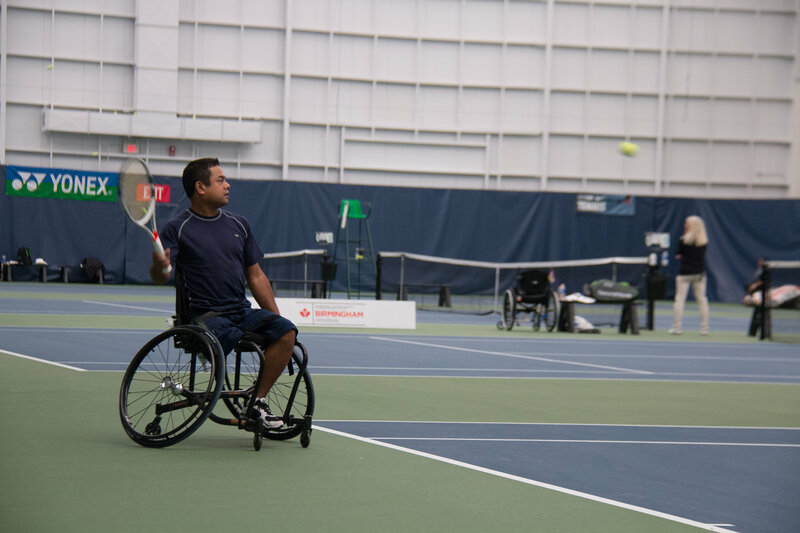 Two Tennis Manitoba products took on the country’s best in Calgary a few weeks ago at the 2018 Birmingham National Wheelchair Championships. The tournament took place from Nov 22-25 at the OSTEN & VICTOR Alberta Tennis Centre, with Jason Betker finishing in the 9-12 group, while James Bernus placed in the top 15. Betker, who’s been playing wheelchair tennis for five years and has now represented Manitoba at the national level on three occasions, said it’s always a special feeling to represent the province. “My goal was to make top 10, gain some experience, and have fun,” Betker said. Bernus said he focuses on improving his skill level year to year, but eventually he’d like to crack the top 10 at nationals. Bernus, who got his start in the sport at 2013, said he’d also like to see more Manitobans give wheelchair tennis a try. James Bernus gets ready to smash a forehand.